Being able to back up files in today’s world is a necessity and for this reason, we will be looking at the MacX DVD Ripper pro. MacX DVD Ripper pro is said to be the best software to copy DVD on Mac with lossless quality and fastest speed. How well does this stalk up? Let’s find out! Just before we go into the nifty fifty with all that the software brings to the table, it makes sense to understand what the software is primarily about, right? 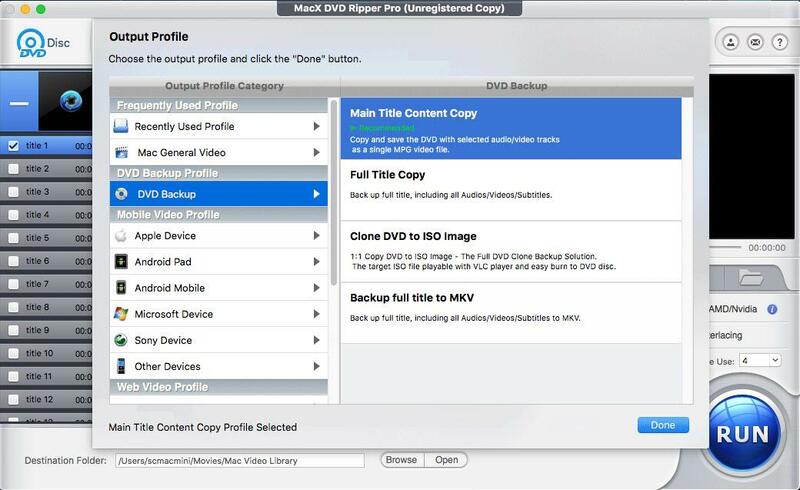 MacX DVD Ripper Pro is the best DVD backup software to back up the protected DVDs, home DVDs to MP4, H.264, HEVC, and other videos for you to watch the movie on Mac. Not just on just Mac, but also on mobile devices. 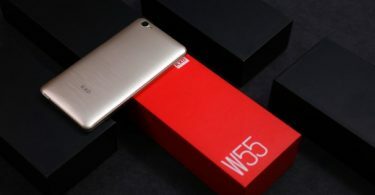 Mobile devices in this case, could include iPhone, iPad, and Phones running Android Operating System. Being able to stream the movie from Mac or NAS drive to HD TV later, is also part of the bargain. The DVD backup software supports the most advanced Level-3 hardware acceleration technology and High Quality Engine. MacX DVD Ripper pro can copy and convert a full DVD with lossless quality with only 5 minutes where many other applications may take approximately 1 hour. The software also supports any type of DVD including the newly released DVD movies, homemade DVDs, 99-title DVDs, TV series DVDs, workout DVDs, end damaged or unplayable DVDs. In the spirit of the black Friday celebration, users can get a free license of the MacX DVD Ripper pro software. Please visit the BlackFriday Giveaway page for more information regarding that. Having discussed what the software is about, let’s look at some reasons why the MacX DVD Ripper pro is said to be the best DVD backup software in the market. There are different reasons as to why this is considered the best DVD ripper and back up software. However, let’s look at a few. 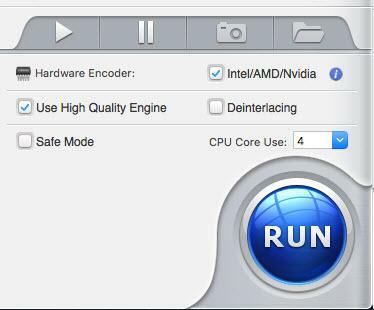 As earlier mentioned, MacX Ripper Pro features unique level-3 hardware acceleration tech. This gives room for backups and processes using the software, run a lot faster. The software allows the hardware of your computer, if configured with Intel graphics that support Quick Sync Video or GeForce 600 graphics card or newer, to assist in DVD decoding, processing and encoding to the full extent. With this in place, the whole DVD ripping process is accelerated to a new level without sacrificing the video and audio quality but easing the burden of CPU dramatically. Based on tests conducted by the team, MacX DVD ripper pro takes merely 5 minutes to copy a 2-hour DVD movie on a MacBook Pro. The whole DVD conversion process is finished under 10 minutes at a rate of 320 frames per second (FPS). When it comes to ripping DVDs, guess is, you are concerned about reduction in quality, correct? Well, you are in luck! MacX DVD Ripper pro ensures the highest possible quality after DVD copying and ripping. This is courtesy of the high quality engine built at the core. In the DVD backup mode, high quality engine automatically activates its demuxing / remuxing kernel to copy DVD content, including video/audio tracks, different subtitles, out of the physical discs without re-encoding, and save them into your computer hard drive swiftly, with video/audio quality untouched. In the DVD conversion mode, high quality engine calls upon interframe and interframe coding algorithms, along with advanced cabac / cavic entropy encoding to reconstruct the DVD content and get rid of temporal and spatial redundancies, in such a way to achieve a more efficient encoding, without losing any information from the original DVD content. As a result, the outfit is almost 98% the quality of the original DCD source. Handrake as a PC program, is often used to compress video sizes. However, in most cases, Handrake can’t read newly released DVD with 99 titles. MacX DVD Ripper pro on the other hand, can auto select the right title instantly without having to manually select a title. With this in place, users can now copy the DVD disc or ISO file with no hassle. If perhaps, some DVDs don’t have subtitles for English or other languages you speak, MacX DVD ripper pro will help you rip them and add external subtitle later. There are other features like being able to trim video clips, segments, merge separate movie titles into one, adjust video parameters etc. Having talked extensively on the software thus far, let’s see how to use the software. To do either DVD backup or conversion, make sure to check the High Quality Engine box. This is a guarantee of high quality DVD processing. To copy DVD to external hard drive like NAS or USB but don’t care about the file size: Back up main/full title content in .mpg or .mkv format. You can get 100% original DVD quality and 5.1 surround sound effect. For instance, a 4TB NAS can house as many as 400 DVD9 movies. To clone DVD for burning: copy DVD to ISO image. There is no quality loss at all and the DVD structure remains unchanged, which is perfect for burning. To backup DVD to Mac’s hard drive and free up some hard disk space: just rip DVD to MP4, MOV. This involves some data compression. But high quality engine ensures almost no quality loss at all. 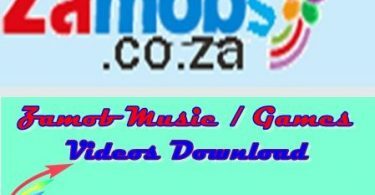 Test date: A 4.8 GB DVD movie is downsized to less than 1GB when it is converted to MP4 format, with unnoticeable pixel difference as compared with the original DVD. To save DVD on Mac with smaller size but higher quality: Rip DVD to HEVC, which is the new video compression standard that is twice as small as H.264 at the same level of image quality. For advanced users, a few tweaks will make the output video crisper. Tip 1: Move the slider bar on the HQ, which will ensure to get high quality video after the ripping. Tip 2: Adjust the parameter settings as per your needs. Note: there is no need to upscale the DVD resolution to higher 720p/1080p/4k 2160p video. The quality won’t enhance but the file size will be enlarged consequently. Frame rate: keep it unchanged. Bitrate: 1000k-1400k. Higher bit rate means better image quality. But too much bitrate also leads to file size increase and more storage space to save the movie. 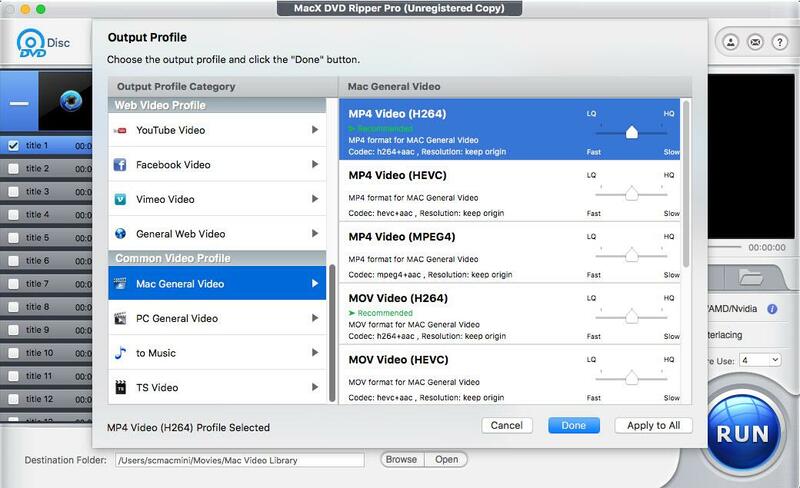 Note: MacX DVD Ripper Pro is preconfigured with 350+ ready-made profiles, categorized in Web Video Profile, Common Video Profile, DVD Backup, Mobile Video Profile, and Frequently Used Profile. You can directly copy DVD on your Mac computer without tweaking the parameter settings. This makes a good balance between the file size and quality, by courtesy of its Full GPU acceleration and High Quality Engine. Once again, MacX DVD Ripper Pro is available at $0 on the occasion of the shopping holiday. 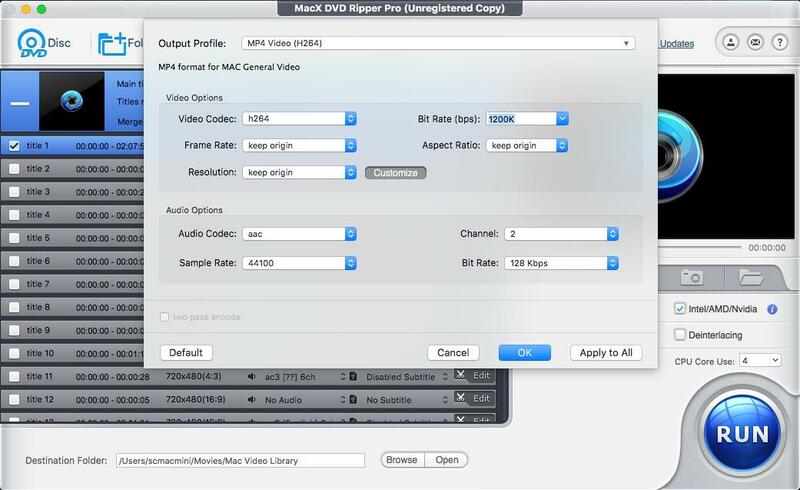 Before December 10, the developer is offering MacX DVD Ripper Pro license key for free, 500 free copies each day. If this is something you are interested in, visit the giveaway page to get one copy for a shot. Hope this answers all that you need to know regarding MacX Ripper pro and how it’s used. Questions? Do not hesitate to ask using the comment session. If You Use An Infinix Android Smart phone, Try Not To Root It!